Maronia (or Maroneia) is a village in the regional unit of Rhodope, in the administrative region of Eastern Macedonia and Thrace, Greece; the history of Maronia is dated back to thousand of years, always related to wine. Dionysus teaching the art of wine-drinking to his son Oenopion, on an Attic black-figured amphora from Vulci (540-530 BC) by Exekias. Maronia was founded by Chian colonists (from the island of Chios) on the SW slopes of Ismaros mountain, in the mid-7th century B.C. and soon developed into a prosperous and densely inhabited city-state. According to tradition, the mythical founder of the city was Maron, a priest of Apollo; he was the son of Oenopion (“wine drinker” in Greek), the legendary King of Lemnos and son of the god Dionysus who was said to have brought winemaking to the island. 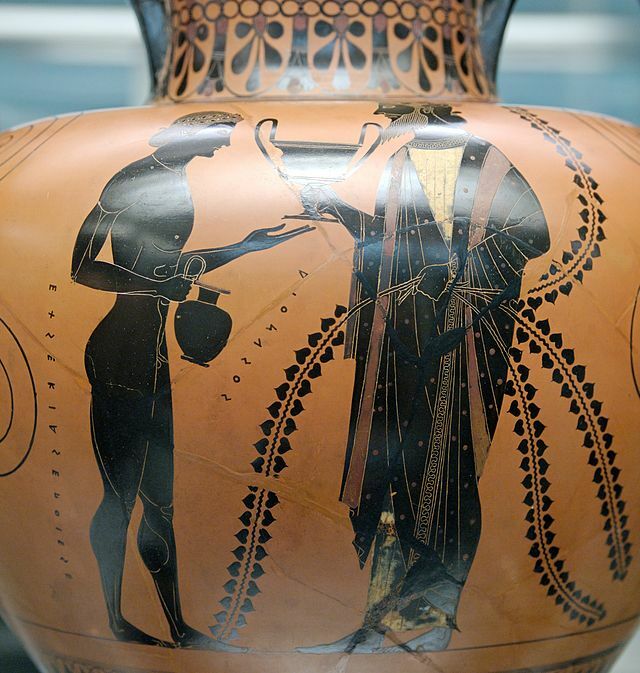 Homer describes Maron’s hospitality and the gifts (among them the famous “Maronios wine”) that he offered to Ulysses (Odysseus) when he visited the land of the Kikones. Indeed in the era of Homer (around 800 bC) we find the first references for the local “Maronios”, “Maronitis” or “Ismarikos” wine. In “Odyssey” (Rhapsody I), it is described as a “sweet as honey, innocent, divine drink” which had to be diluted with 20 parts of water; then the color of the wine from blackish would turn into red and sublime aromas would burst from the krater. 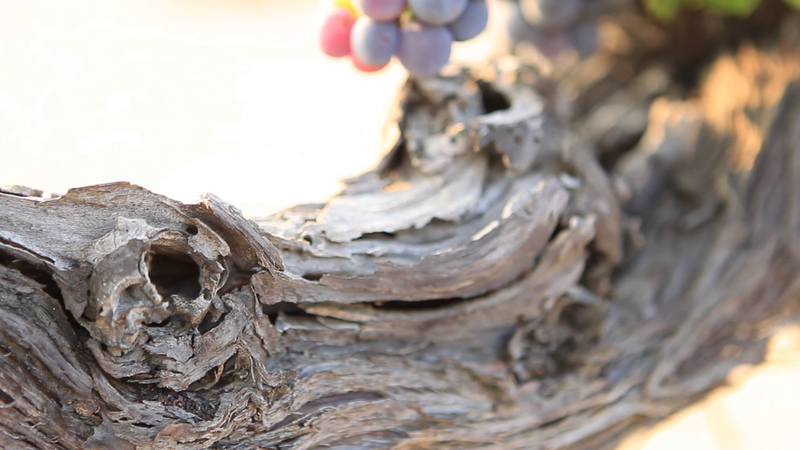 This dark red wine came from large-fruited grapes that were produced locally in abundance thanks to Zeus. Maronios or Maronitis wine was also characterized as “akerasios“, meaning “pure”, without any intervention. According to the myth, Maronios was the wine used by Odysseus in order to get drunk the Cyclops Polyphemus. As the resourceful hero describes: “Then I bade the rest of my trusty comrades to remain there by the ship and to guard the ship,  but I chose twelve of the best of my comrades and went my way. With me I had a goat-skin of the dark, sweet wine, which Maron, son of Euanthes, had given me, the priest of Apollo, the god who used to watch over Ismarus. And he had given it me because we had protected him with his child and wife  out of reverence; for he dwelt in a wooded grove of Phoebus Apollo. And he gave me splendid gifts: of well-wrought gold he gave me seven talents, and he gave me a mixing-bowl all of silver; and besides these, wine, wherewith he filled twelve jars in all,  wine sweet and unmixed, a drink divine. Not one of his slaves nor of the maids in his halls knew thereof, but himself and his dear wife, and one house-dame only. And as often as they drank that honey-sweet red wine he would fill one cup and pour it into twenty measures of water,  and a smell would rise from the mixing-bowl marvellously sweet; then verily would one not choose to hold back. With this wine I filled and took with me a great skin, and also provision in a scrip; for my proud spirit had a foreboding that presently a man would come to me clothed in great might,  a savage man that knew naught of justice or of law.1 “Speedily we came to the cave, nor did we find him within, but he was pasturing his fat flocks in the fields. So we entered the cave and gazed in wonder at all things there. The crates were laden with cheeses, and the pens were crowded  with lambs and kids. Each kind was penned separately: by themselves the firstlings, by themselves the later lambs, and by themselves again the newly weaned. And with whey were swimming all the well-wrought vessels, the milk-pails and the bowls into which he milked. Then my comrades spoke and besought me first of all  to take of the cheeses and depart, and thereafter speedily to drive to the swift ship the kids and lambs from out the pens, and to sail over the salt water. But I did not listen to them–verily it would have been better far–to the end that I might see the man himself, and whether he would give me gifts of entertainment. Yet, as it fell, his appearing was not to prove a joy to my comrades”. Homer, Odyssey, Book 9, Lines 193-225. Besides the acclaimed Epic Poems by Homer, the local wine was mentioned in many texts among the quality wines from Greece. Poludeuke (Julius Pollux), a Greek grammarian and sophist of 2nd century AD, on his work “Onomastikon“, a thesaurus of Attic synonyms and phrases that offers valuable information about life details in antiquity, writes about the most famous wines to be traded with their Appellations of Origin: “Thasos (island), Arioussios from Chios island, Mendeos from Mende (Halkidiki), Ismarikos, Lesvios (from Lesvos island), Peparetheos (from Skopelos island), Pramneos (from Ikaria island) and Maronitis“. The bond with winemaking is evident in ancient discoveries: decorative vines can be found in ancient coins and a spectacular mosaic found at a large private house, in the men’s quarters (andron), dated to the end of 4th or the beginnning of the 3rd century bC. At the same time, wine presses curved in stones can be found in Mount Ismaros dated back to 700bC, as well as the Sanctuary dedicated to Dionysus (400 bC). 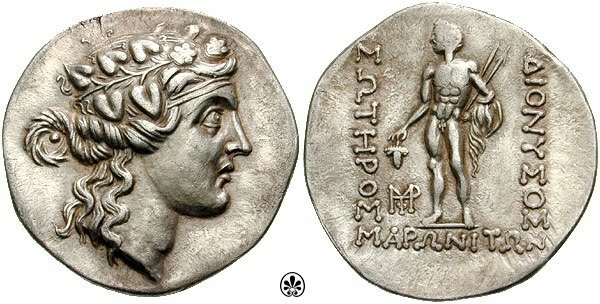 Maronian Tetradrachm ancient coin c189-145 BC.